USAID has asked HFG to address three major health areas in Côte d’Ivoire: human resources for health (HRH), health financing, and health governance and decentralization. HFG activities in Côte d’Ivoire are funded by the U.S. President’s Emergency Plan for AIDS Relief (PEPFAR) and align with the USAID and PEPFAR goal of achieving an AIDS-Free generation through health system strengthening, as outlined in the “Road Map for Smart Investments” in the PEPFAR Blueprint. Human Resources for Health: HFG and the Ministry of Health and Public Hygiene (MHPH) worked together to develop an updated and costed HRH strategic plan for 2014/2015. A key focus is improving capacities and competencies of midwives and nurses to directly address the challenges related to achieving Millennium Development Goals 4 and 5. The country’s first post-conflict plan to address HRH issues, the strategy was the result of a participatory process with Ministry of Health officials, donors, and partners involved in national HRH policies. It was approved by the Côte d’Ivoire government in 2014. Stakeholders also agreed upon a revised set of health position descriptions and an HRH skills index drafted by the MHPH with support from HFG. The HFG project is also supporting the MHPH, the Ministry of Higher Education, and the Ministry of Social Affairs to design and develop (or adapt) tools for an institutional capacity assessment for pre-service medical, paramedic, and social sector health training institutions. These tools have been piloted in an assessment of a training institution, which included more than 900 interviews. 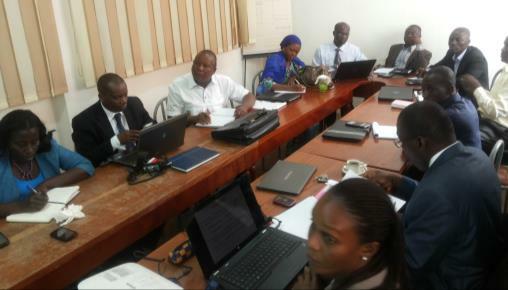 Health Financing: HFG supported the Department of Planning and Statistics to develop and finalize a performance-based financing (PBF) model for health services. Through the implementation of the PBF model, Côte d’Ivoire has seen an improvement of working conditions and increased motivation of staff to care for people living with HIV and address the fight against HIV/AIDS. These positive results were demonstrated with district management teams under the Ferfessedougou pilot project to address HIV services under the Health Systems 20/20 Project in 2010-2011. Health governance: HFG has also worked with Support for Donor Services and Decentralization (SASED) to strengthen the decentralization of health delivery. HFG has partnered with SASED and the MHPH Technical Working Group to facilitate training on results-based management at the regional level.